Every year, Americans from around the country sacrifice their time and personal well being to protect the freedoms that we hold so dear. Oftentimes leaving work to do so, individuals may be gone for days, weeks, or months after receiving orders. Fighting for their country, these military personnel often give up civilian life when their services are needed. Acknowledging the sacrifice these individuals make, the government has a number of laws that help to protect a civilian called into active duty. Beginning with Veterans’ Reemployment Act, individuals are protected in their civilian jobs and are provided benefits if called to duty. In 1994, the Uniformed Services Employment and Reemployment Rights Act (USERRA) were passed by then president Bill Clinton. Its primary goal was to help protect the rights of military personnel in civil employment when they are called to serve their country. Applying to all uniformed service individuals and their respective reserve components, the USERRA is a broad reaching law that provides protection for the individuals who serve to protect us. 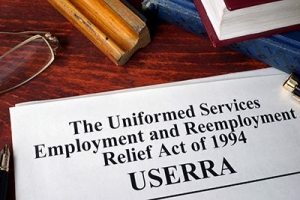 USERRA dictates that every military personnel called into active duty is allowed to have re-employment rights for up to 5 years of being absent. Aiding in the protection of veteran and deployment discrimination, USERRA helps individuals who serve this country have a place of employment and stops them from being improperly fired due to circumstances outside of their control. Incredibly helpful for military events, USERRA is eligible for all no longer active duty uniformed military personnel who are called into duty. As long as the individual reports back to employment in a timely fashion after their military deployment, they have full rights and access back to their job. Whether knowingly or unknowingly, a company may have terminated or otherwise changed your employment in contradiction to the laws set forth in USERRA. If you believe you are the subject of discrimination, then give us a call today. We can help review your case, what protections USERRA provides, and where you can go from here. Bringing to bare years of experience for our clients, we help you get the justice you deserve. In thanks to the community that sacrifices their safety for our freedom, we work to make each and every case unique, focusing our time and attention on your needs. Don’t wait another day; consider giving us a call now.